If you ask me about the most beautiful square I have seen during my travels around the world, I will be hard put to answer you. From Sukhbataar square in Ulaan Bataar (Mongolia) to the futuristic square of the Brazilian National Congress building in Brasilia (Brazil), the world is full of beautiful squares. 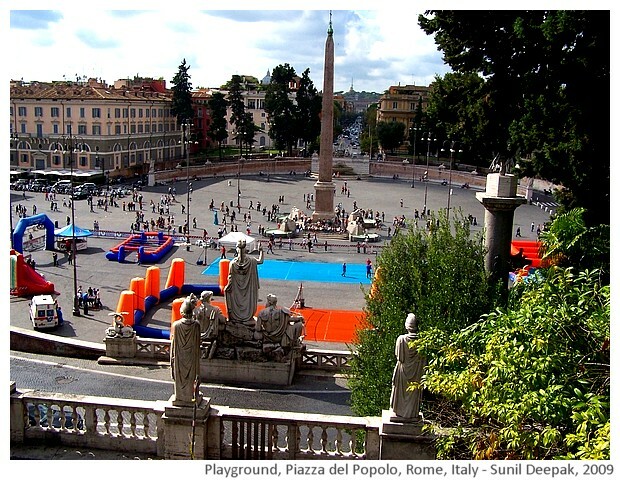 Still, the People's square in Rome, called Piazza del Popolo by the Italians, would be near the top of the list. 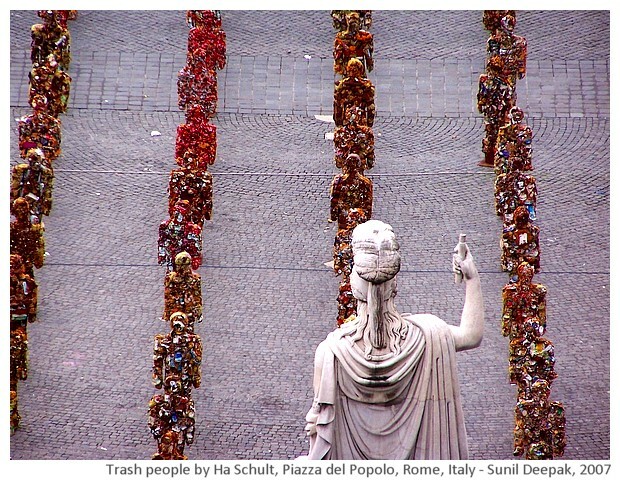 This post is for sharing some of my favourite photographs from the People's square in Rome. 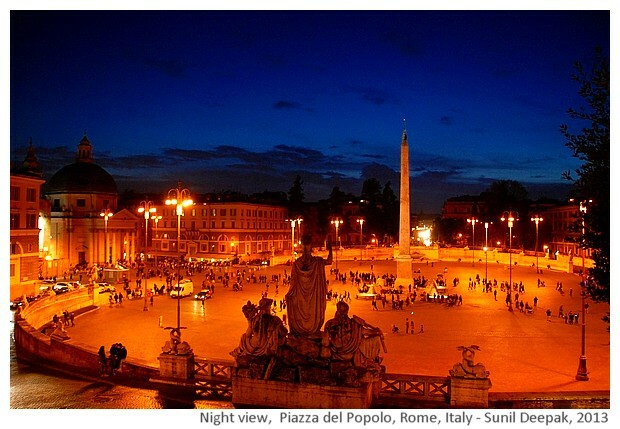 "Piazza del Popolo" is an oval shaped square, elongated at the two ends. The picture above, showing a night view, gives an overview. 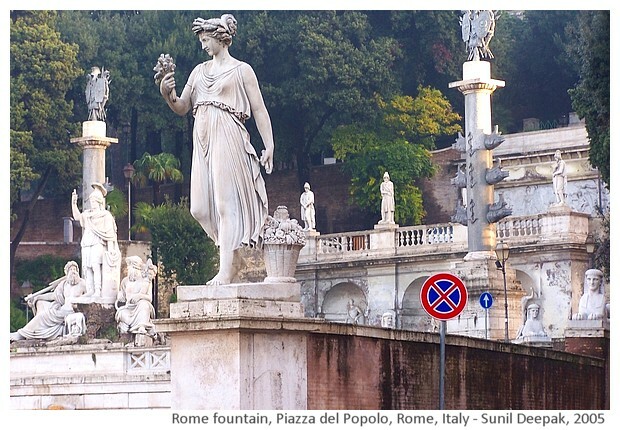 It was taken from a small hill (Pincio hill) on the eastern side of the square and shows the back of the Rome statue with two rivers sitting on his two sides. 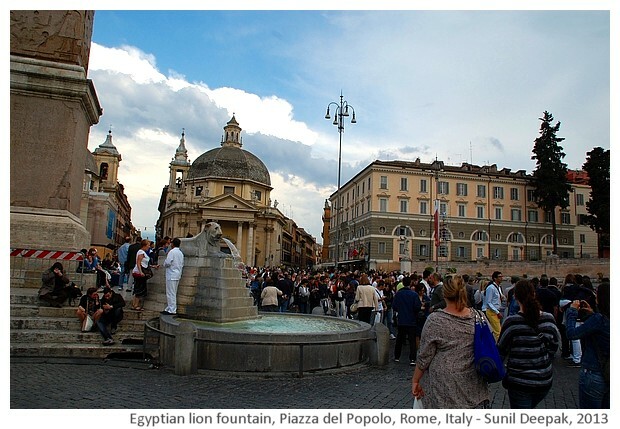 In the middle of the square, there is an Egyptian obelisk surrounded by fountains. On the opposite end, there is the Neptune statue and the road behind it goes towards St. Peter's. On the right side, to the north, where we see the branches of a tree, is Santa maria del Popolo church and the Flaminia gate. On the left side, we can see one of the twin churches, and the three streets between them (the Trident) going towards the centre of Rome. Historians say that this square was the site of a shrine to the Roman emperor Nero and that shrine was destroyed in 11th century, replaced by a church. Some people believe that Nero was greatly loved by the Romans. The church did not like Nero's cult so his shrine was destroyed and his reputation was deliberately smeared by saying that he had made Rome burn and then played fiddle, while people were running around, trying to salvage their belongings. Others' say that Nero's shrine was destroyed because his ghost used to trouble the Romans. Another story about this square is that once there was a forest of Poplar trees that gave this square its name, though now the word "popolo" is understood as "people". The gate & the church from "Angels and Demons"
Any way, let us start a virtual tour of this square. We shall start from the northern end, which has the Aurlian walls and the Flaminia gate. Flaminia was one of the ancient roads of Roman empire that went towards Rimini on the north-eastern coast. Along the Aurlian walls was Muro Torto (crooked wall) with the un-sanctified cemetery where criminals, prostitutes and other marginalised persons were buried. 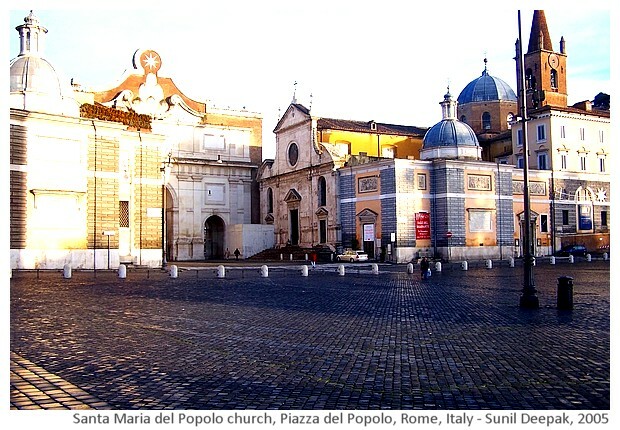 The picture above shows square side of the Flaminia gate and on the right, Santa Maria del Popolo church. This gate was designed by Michelangelo and built by Vignola in the 16th century. In 17th century, to welcome the queen Christina of Sweden, who had converted to Catholicism, welcome words were written above the gate. 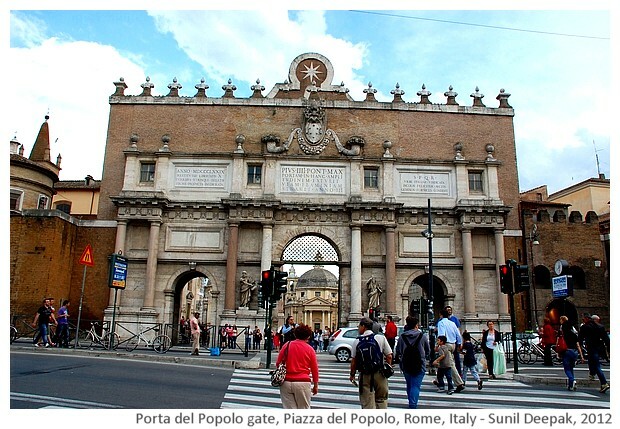 The picture below shows the same gate, also called Porta del Popolo (People's gate) from the outside, from the side of the Flaminia metro and railway station. 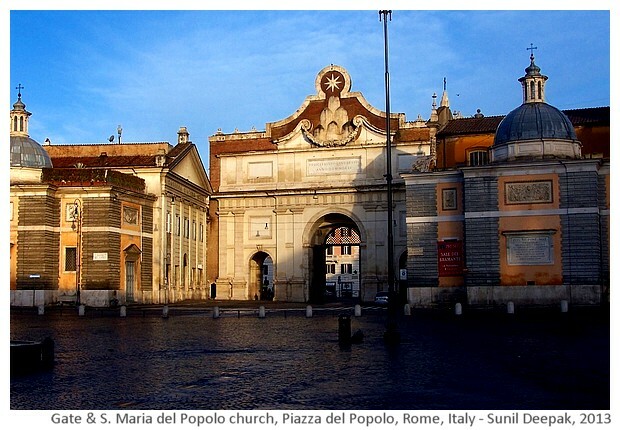 The picture below shows Santa Maria del Popolo (St. Mary of the people) church, next to the gate. This church is full of mosaics, paintings, sculptures and is made in rich baroque style. I love the two paintings of renaissance artist Caravaggio in this church. It became even more famous because of the popular writer Dan Brown, whose book "Angels and demons", on which a film was also made, had scenes based in this church. Thus, this church is often on the tourists' visit list. 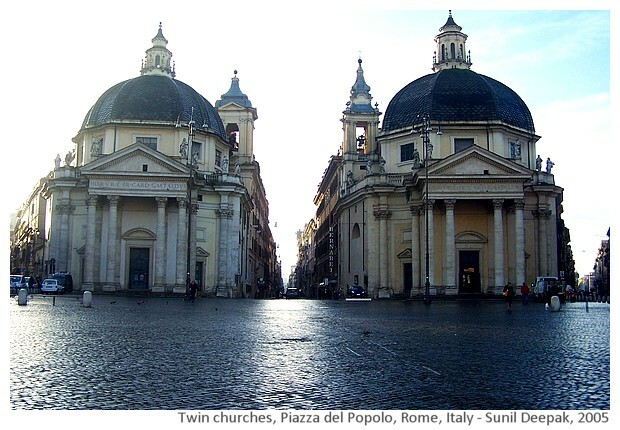 On the other side, opposite the Flaminia gate, are two churches, also known as twin churches. I love the picture of the twin churches below because it was taken on an early morning, around 6 AM and thus, the square was almost empty. If you just take a casual look, the two churches look similar, however they are not exactly the same. 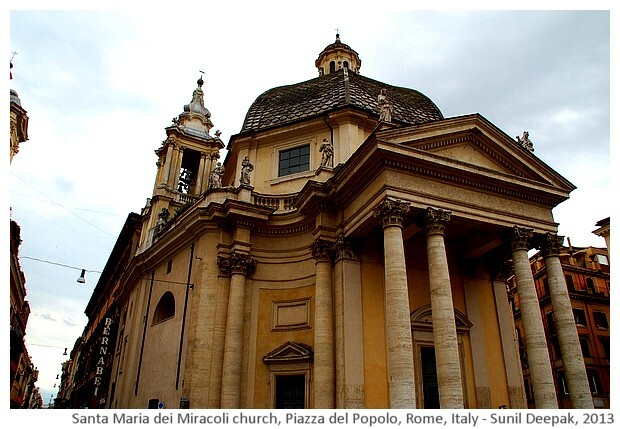 The church on the right, Santa Maria dei Miracoli, has an octagonal (8 sided) dome while on the left, Santa Maria di Montesanto church, has a ten-sided dome. If you look again at two domes above and count the number of sides you can see, clearly the dome on the left has narrower sides. As the whole square is so imposing and monumental, it is not easy to stop and look at the details. However, if you have time, stop and look carefully and each building is full of interesting details. 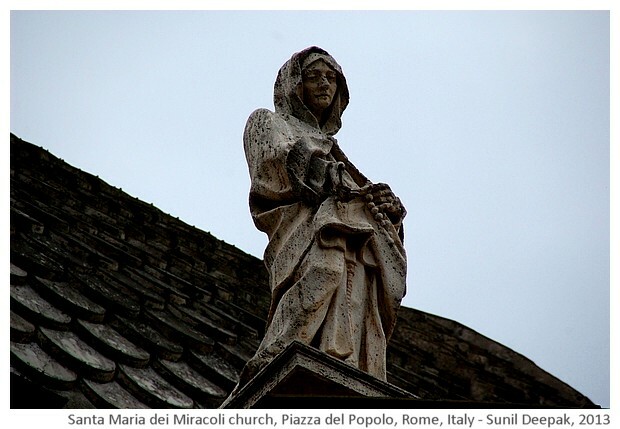 As an example, the next 3 images show some details from the Santa Maria dei Miracoli church. Now let us look at the Egyptian obelisk at the centre of the square. The picture below is from my early morning visit in 2005 when this obelisk was undergoing restoration. Except for that one occasion, I have always found this place teeming with persons. 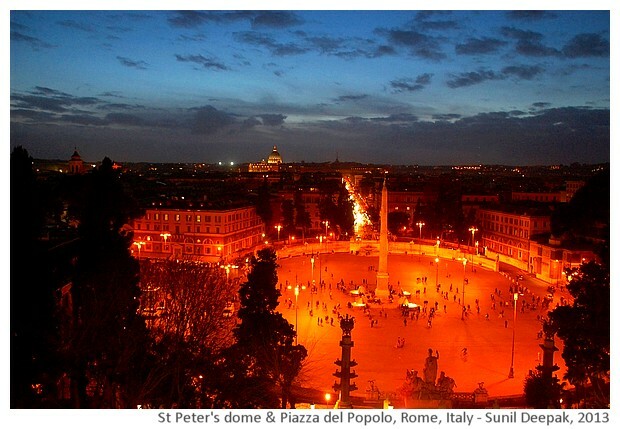 In the image below, you can see the dome of St. Peter's in Vatican city, against the Rome skyline. This view of the square is from the Pincio hill. Coming back to the obelisk, it is more than 3000 years old. It was brought to Rome in 10 AD by Roman emperor Augustus when Egypt had become part of the empire. For centuries, this obelisk was placed in Circo Massimo, the site of Roman sporting events, near Colosseum. 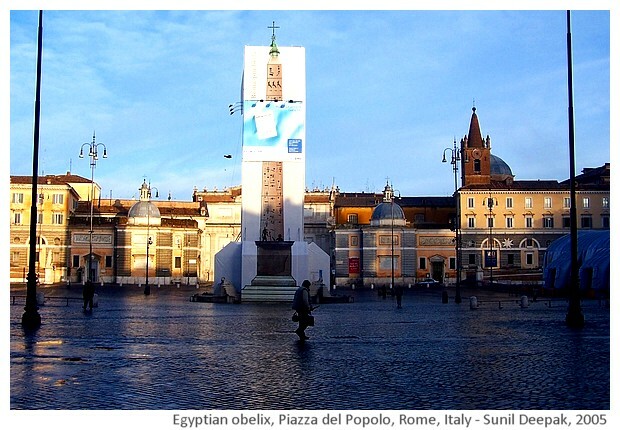 This obelisk, from the times of Egyptian Pharaoh Ramses II, was shifted to this square in 16th century. 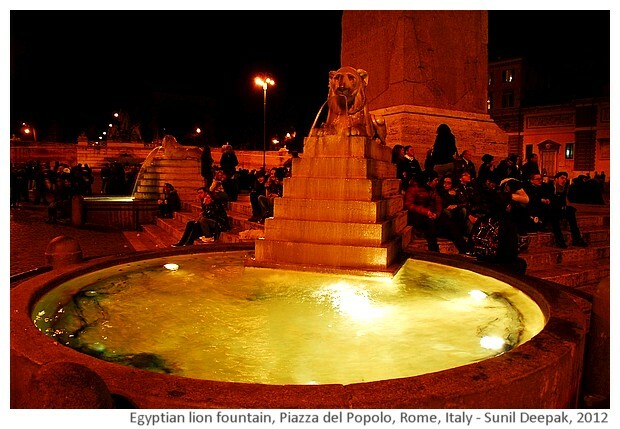 In 19th century, 4 fountains with Egyptian looking lions were built at its base. The images below can give you an idea of this place in summer, when the whole square seems full of people and there is hardly a place to sit here. Gus Van Sant's "My own private Idaho" was shot here, and there was a scene where Mike (River Phoenix) wakes up at the base of the obelisk. Many other films have been shot here. In 1945, Rossellini had shot here "Rome, open city". Via Margutta, a side street of Via del Babuino, near Santa Maria di Montesanto has the house which was shown as Gregory Peck's home in Roman Holidays (1953). In 1974, Italian director Ettore Scola had shot here "We all loved each other so much" (C'eravamo tanto amati). In 1978, Weber had shot "Hotel Locarno" at the eponymous hotel on the side of this square. However, the most significant film shot here was probably, "In the Year of the Lord" (Nel anno del signore) by Italian director Gigi Magni in 1969. This film was about rebellion against the rule of the Pope Leo XII in Rome in 18th century when two Carbonari resistance fighters, Angelo Targhini and Leonida Montanari were executed here. A plaque on one of the walls of the square commemorates their fight. Let us take a look at the two fountains and sculptures on the eastern and western corners of the square. 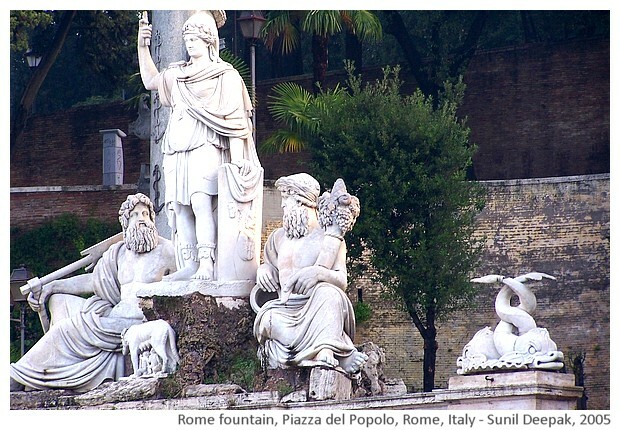 On the east, the group of three sculptures has Rome standing with the two rivers, Tiber and Anniene, sitting by his sides. In the centre, in front of Rome, is the symbol of Rome - a female wolf feeding the twins, Romulus and Remus. According to this story, Romulus had founded the city of Rome. I was a little surprised by these statues because I would have imagined Rome and the two rivers in female forms and not as men. Around the central sculptures, there are many other sculptures on the sides and at the back, as you can see in the 2 images below. 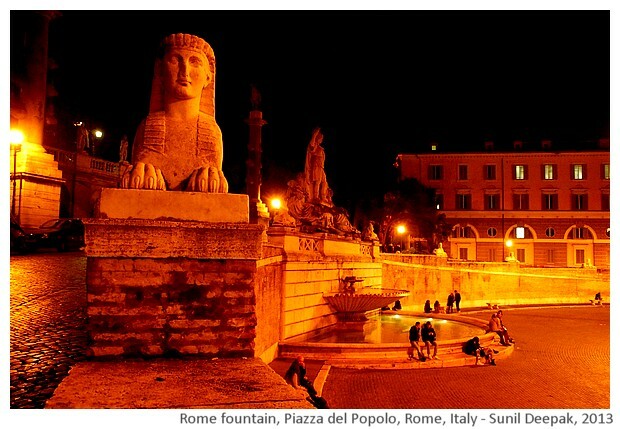 Below, in the night image of the Rome sculpture on the eastern end of the square, you can see also see the Egyptian sphinx as well the fountain underneath. 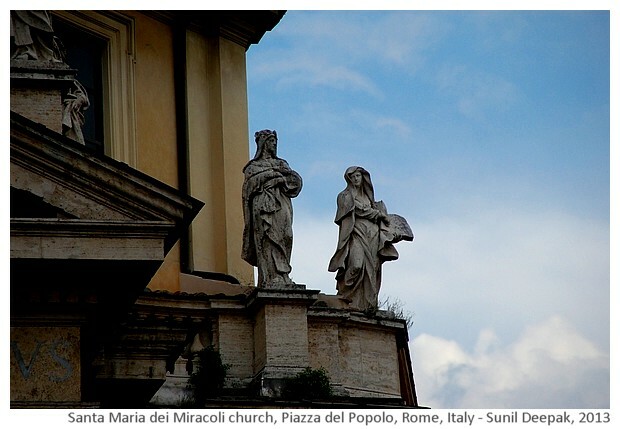 Above the Rome group of sculptures, you can also see the terrace at the top of Pincio hill. 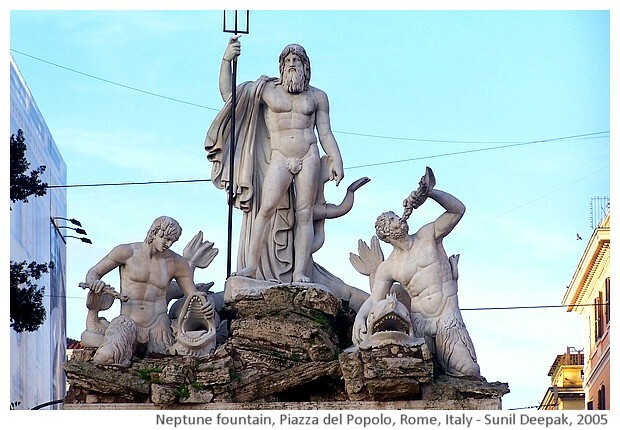 On the opposite side of the square, the group of sculptures is dominated by Neptune, holding the trident in his hand. 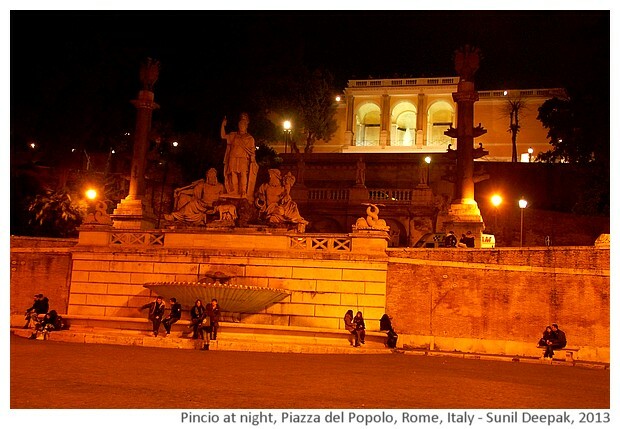 Piazza del Popolo is a hugely popular place, often the venue of music concerts and art exhibitions. The images below present some of those special events. 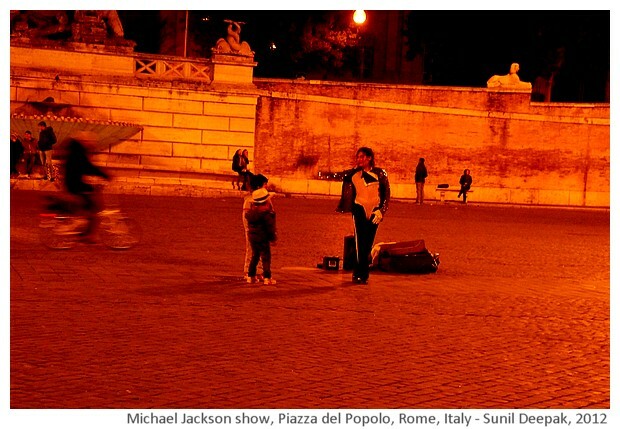 The image below has a Michael Jackson look-alike showing the dance steps of his idol in the square. 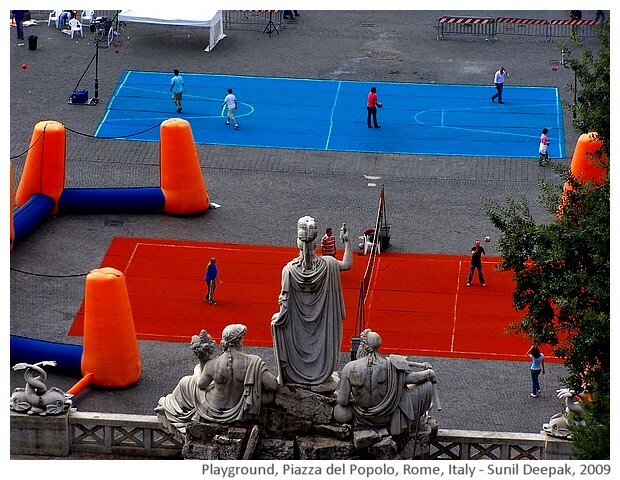 The two images below are from a sports function in the square, where Rome statue seems to be playing the role of the referee. 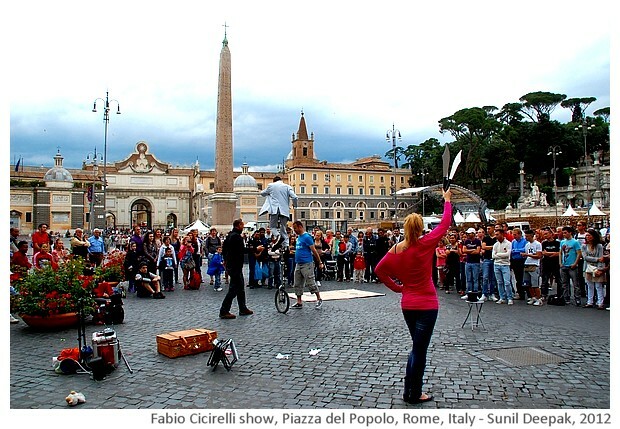 The image below has a street artist called Fabio Cicirelli showing acrobatics. 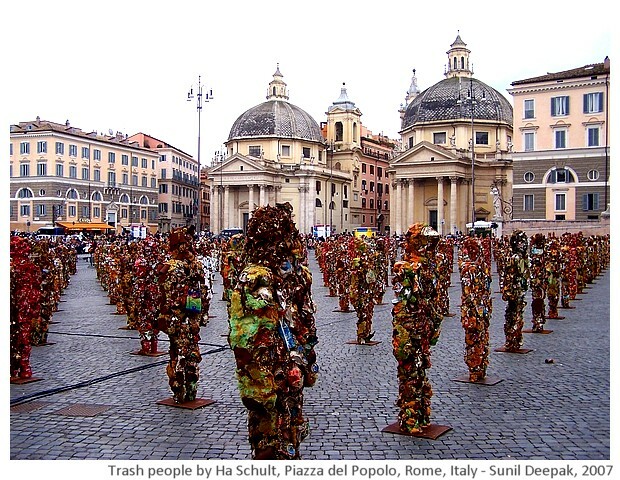 The next two images are of a wonderful art installation called "Trash People" made by Hu Schult in 2007. 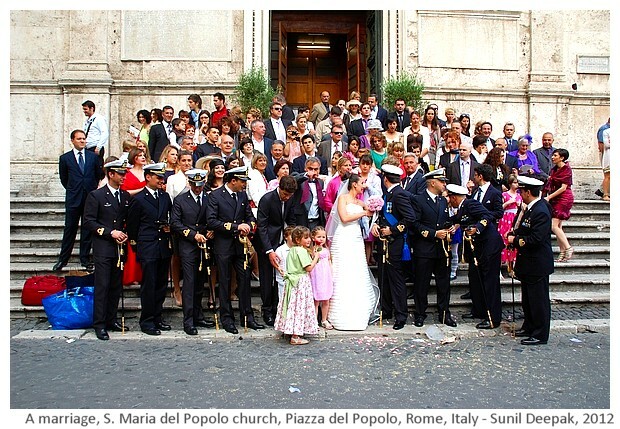 Finally, to close this post, the group picture from the marriage of a naval officer in front of the Santa Maria del Popolo church. 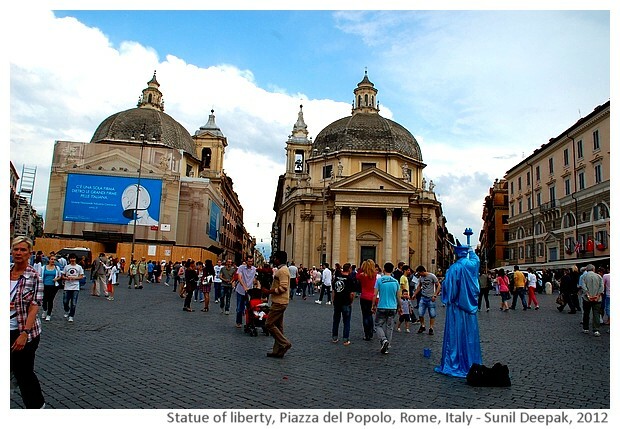 I hope that you have liked this virtual tour of the Piazza del Popolo square. For almost 20 years, I have crossed this square so many times, on my way to the meetings, as usually I needed to change the bus at Flaminia. I have enjoyed visiting this square so many times, sometimes only rushing through, at other times, sitting under the obelisk and thinking of the history this place must have seen. This post is my way of saying thank you to this square for all the pleasure I have received from it! Lovely pictures - I've always wanted to visit Italy for its beauty, but the history as you've demonstrated here is very interesting as well!